I have a few favourite spots to go to, for two reasons, they have good views and I can be off the road. This is one of those.It is a simple scene, but I think it is pretty. 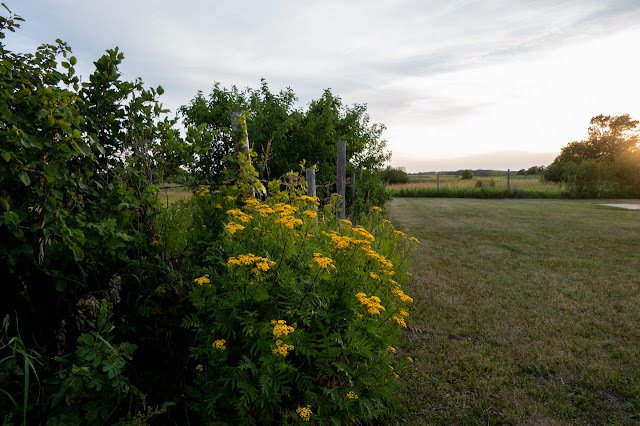 The yellow flowers up front are called Tansy and here is a close-up view. 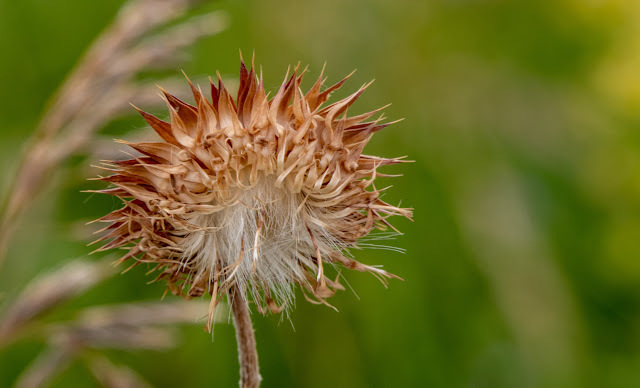 Driving down a country road,I saw this spent thistle.I know the flower is gone, but there is still beauty. As I look at this, I think of people, myself included, as we get older.The flower of your may be gone, but there can still be beauty. 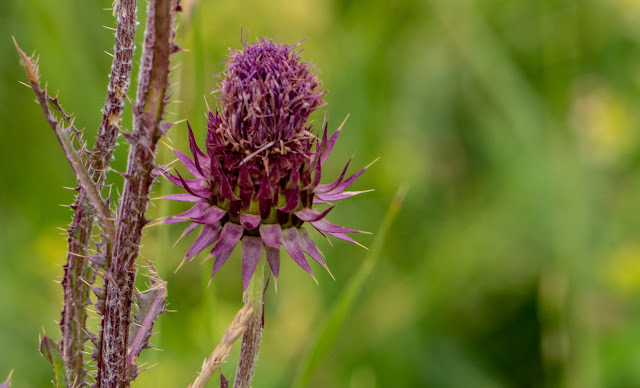 Here is another flower, mostly done.Those purple spikes around the flowerhead, are what got my attention. 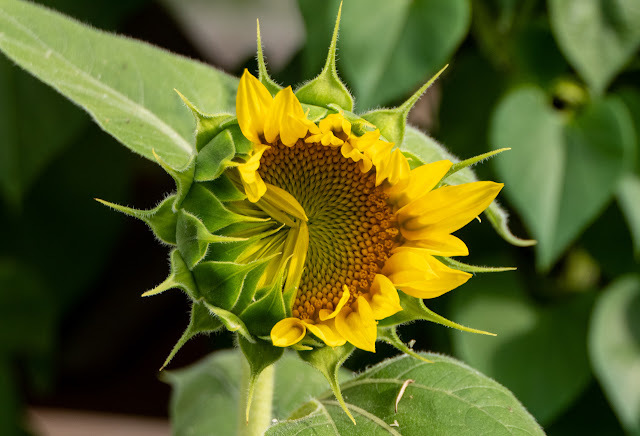 This flower was a freebie.By this I mean, that I did not plant it.It grew up from a seed that a bird likely dropped into the flower pot.The flower head was not very large, maybe 6-8 inches in diameter, but it intrigued me,. Let us take a lesson from the flowers.Age doesn't matter, nor does our status in life.We can be beautiful at any age. And like that sunflower, let's bloom where we are planted. All beautiful! We can find so much beauty when we stop to look for it. Thanks for sharing! Such lovely photos, Ruth! Although they are all lovely, I admit to being partial to the first one. Wouldn't that be a lovely stroll on a summer evening? 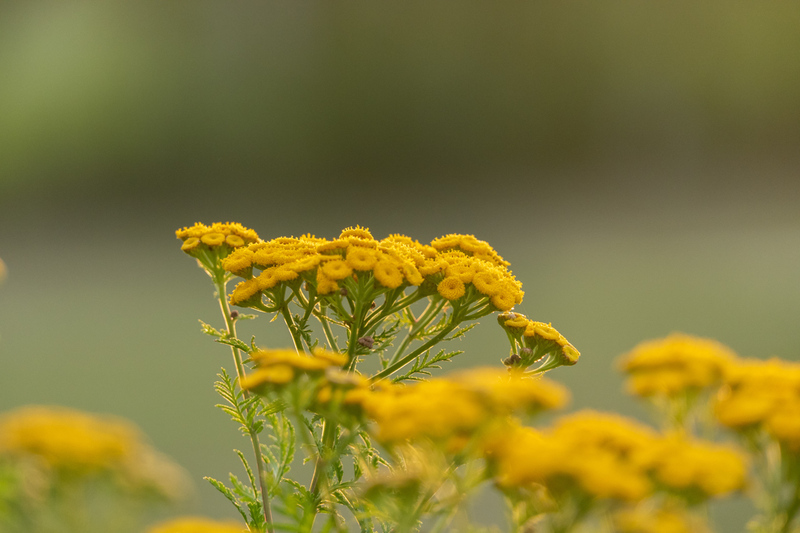 The tansy is a very intense yellow! I don't think I have ever seen one. I do agree that these spent flowers have their own beauty! A free sunflower! A beautiful gift from nature. Thanks for taking us along on your drive in the country and for the beauty you've shared with us. Thanks,too, for the words of wisdom. oh how I wish a sunflower would drop in my yard. I do love them. the thistles are beautiful bot the dried up and the purple. I feel the same way. especially now as I grow older. Beautiful images. I have a few sunflowers that popped up around the house too that I didn't plant. Such happy surprises. gorgeous blooms, captured at all stages of life!!! Your photos capture the geometry and beauty that Nature bestows. I love Tansy - it's so simple and colorful.